It has such a wonderful ring to it...doesn't it? I crawled out of bed extra early to stand at an auction all day...and did I mention is was only 5 degrees here? But it was all worth it...because I came home with these. 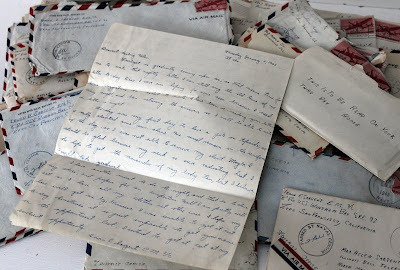 92 of the most beautiful letters...lovingly written back and fourth...from Irwin to Helen during WWII. Have you ever really read a letter from that era? Twilight is gradually coming upon us..."
They are so sweet...so romantic...so genuine. That is why they made my list of "99 things I love". Notice the letter was written 65 years ago...almost to the day. Somewhere out in the Pacific Ocean that night was a ship...with a lonely young man that missed his wife. I can't help but wonder where Irwin and his bride are today. Did they live a long, happy life together? Do they have children? If so, why would they not want to keep the letters? 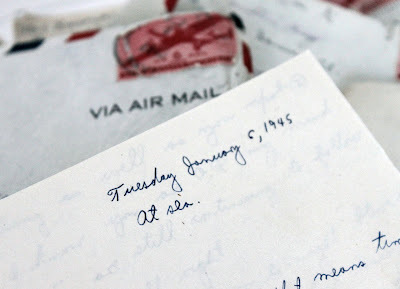 In one of his letters, he mentioned he had written one to her every single day before he went to sleep. Tonight, my hubby will build a fire...and I will curl up on the couch...immersing myself in the words of Helen & Irwin. The most perfect winter Saturday night. How wonderful, Mary! I'm so glad their letters found a home in the hands of someone who will cherish them! What a find! Have a beautiful evening. Oh how special! My hubby just told me that after his grandparents died, they found a box of letters like this, and his family burned them. Then, Jade & I both cried! Oh how I would have loved those letters! Hey - I'm on your sidebar! You are the best!! Oh, what a beautiful find. That is the most amazing treasure. I wish I could read them too. I am sad though that their families do not have them. I know you will cherish them and take good card of them. I hope you share more of their words. Oh! I hurt for them! Where are they? Where are their children?! You have a precious gift!! One to hold onto forever! Oh! 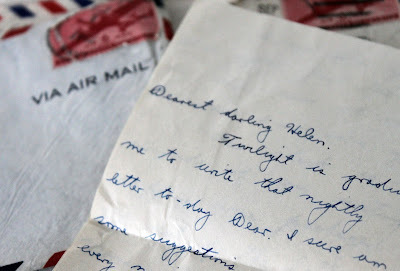 I'm so glad the letters are with someone who will treasure them, just as Helen did so long ago. Mary- maybe sometime you can share some of them with us? Thanks for this post. I wish I could show you more but that's all I have for now. This girl needs to do some shopping but the weather has been to cold and nasty. I hope to fix that this week. Hang in there! The best is yet to come..I hope! LOVE those letters. I hope your mom is doing well. So romantic! I'd love to hear some of the excerpts from Irwin's letters! So beautiful...and so nice to know that they went home with someone who will treasure them...okay...now I'm off to write by blog award post. It was wonderful to of you to share these gorgeous letters! I had a penpal and adored every letter! I wish the art of handwriting would come back! Hi Mary - I enjoy reading your blog and seeing the beautiful treasures you discover. But these letters are by far my favorite. I'm so touched by the salutation and first line! Like you, I enjoy all things antique and vintage because of their stories. I get so excited for each of your posts because I get new ideas! Thanks!